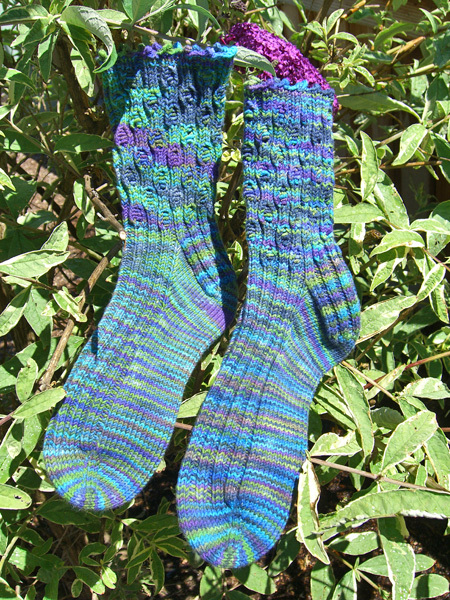 The Lapis socks (now renamed Tangled Up In Blue) are finished, washed and blocked. And here they are, posing on my Butterfly Bush. Click on the pic for the bigger version so you can see how weirdly fraternal these socks turned out. It’s the same yarn, but you’d hardly know that to look at it. The sock on the left has much more of the lime green color apparent, and it pooled a lot. The sock on the right has more of the turquoise blue, didn’t pool at all, and striped on the ankle. Go figure. I don’t care. I like them in their fraternalness. If I wanted them to look the same, I wouldn’t have picked hand-dyed yarn! One other point: If they look skinny for their length it’s because I made them to fit my feet. The pattern is written to fit people that have normal feet!